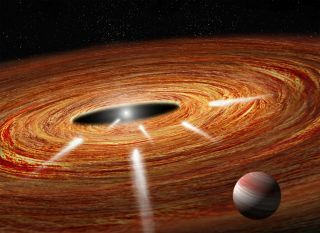 Exocomets plunging toward a young star in the Beta Pictoris Moving Group located 95 light-years from Earth. A Jupiter-size planet is shown in the star's protoplanetary disk of dust and gas. NASA's Hubble Space Telescope has detected several comets diving toward a young star about 95 light-years from Earth. The star, known as HD 172555, is approximately 23 million years old and represents the third extrasolar system where astronomers have detected such comets, according to a statement from NASA. They are known as "exocomets" because they're outside Earth's solar system. "Seeing these sun-grazing comets in our solar system and in three extrasolar systems means that this activity may be common in young star systems," Carol Grady, lead author of the study from NASA's Goddard Space Flight Center, said in the statement. "This activity at its peak represents a star's active teenage years. Watching these events gives us insight into what probably went on in the early days of our solar system, when comets were pelting the inner solar system bodies, including Earth. In fact, these star-grazing comets may make life possible, because they carry water and other life-forming elements, such as carbon, to terrestrial planets." HD 172555 is part of a collection of stars known as the Beta Pictoris Moving Group. Another one of the stars, Beta Pictoris, is known to have a young gas-giant planet forming in its protoplanetary disk of dust and gas. This collection of stars is the closest star system to Earth and could be a breeding ground for terrestrial planets, Grady said in the statement. Silicon and carbon-gas signatures were detected in the vicinity of HD 172555 using Hubble's Space Telescope Imaging Spectrograph (STIS) and the Cosmic Origins Spectrograph (COS). "The gas was moving at about 360,000 miles per hour across the face of the star," officials said in the statement. "The most likely explanation for the speedy gas is that Hubble is seeing material from comet-like objects that broke apart after streaking across the star's disk." However, in order to confirm that the gaseous debris is in fact leftover comet material, researchers will have to find chemical fingerprints of oxygen and hydrogen. "Hubble shows that these star-grazers look and move like comets, but until we determine their composition, we cannot confirm they are comets," Grady said in the statement. "We need additional data to establish whether our star-grazers are icy like comets or more rocky like asteroids." The study findings were presented Friday (Jan. 6) at the 229th Meeting of the American Astronomical Society. The researchers plan to conduct additional surveys of HD 172555 using Hubble's STIS.